A mass uptake of electric car usage could reduce motorists’ fuel costs by £13 billion and drive down the UK’s oil imports by 40 percent by 2030, a new study has suggested. The Cambridge Econometrics study, commissioned by the European Climate Foundation, found that a surge of electric car sales would save each driver £1,000 per year and result in the near elimination of air pollutants by the middle of the century. The authors note, however, that the shift towards sustainable vehicles would require investment in new infrastructure. 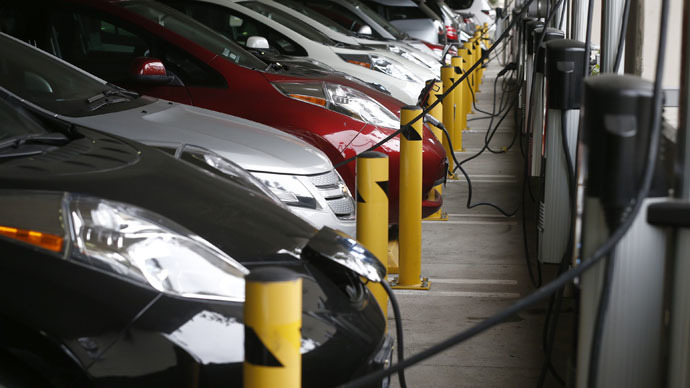 The problem of range anxiety – concerns that cars may run out of power between charging stations – has previously been one of the major deterrents for potential consumers. While the European Commission proposed an infrastructure program which would have increased the numbers of charging stations in the UK to 1.2 million, the Conservatives opposed the measure due to the increased investment required. The study found the gains to be made from greater emancipation from oil could amount to between £2.4 billion and £5 billion by 2030, with between 7,000 and 19,000 jobs created. “To maximize those benefits, however, international policymakers have to create a consistent and robust regulatory framework,” he said. A recent poll from the Automobile Association found only 1 percent of drivers would currently opt for an electric car when they came to change their vehicle. Low emissions and fuel economy, however, were ranking as important factors when choosing a new car. “Our research shows that drivers’ attitudes are changing when it comes to choice of car. Drivers want fuel efficient cars that are also reliable, safe, comfortable and easy to service. However, there is still a massive leap of faith to be made before drivers fully embrace full zero emission vehicles,” said Edmund King, the AA president. Summerton told the Guardian that decisions needed to be made about infrastructure before consumers start to invest. “First you have to figure out whether to shift the hydrogen in trucks or build a pipeline [to feed refueling stations],” he said. “When consumers feel confident that a technology has the right supporting technology, the market will move in that direction,” he added.